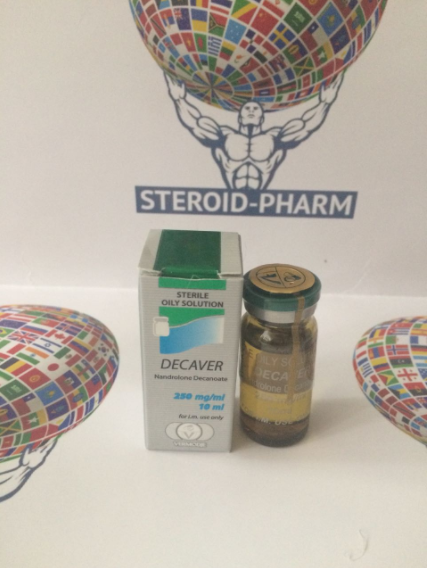 Decaver Vermodje is another popular anabolic steroid, better known in-between the people as Deca (Retabolil). Produced in vials of 10 ml., As well as in ampoules of 1 ml. The active substance is nandrolone decanoate - 250 mg. Although the drug was first synthesized 64 years ago, but how much he has won the hearts of millions of bodybuilders, which remains one of the most popular AU for beginners to this day. 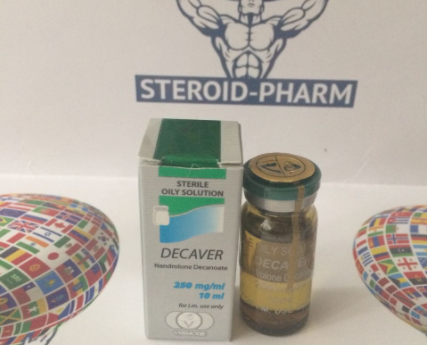 It is the Decaver that is most often used on the first course of steroids in combination with methane. Instructions for use: As mentioned above, Dekager is the favorite steroid of beginners. But applying Dekaver, it should be remembered that some percentage of users, the work of the drug may not feel. In my practice, this has not happened yet, which means that this percentage is very small. For many, Deca, a wonderful drug, for a 6-week course of which you can get about 8 kg. Muscles, and almost all that you have collected will be able to save. It should be remembered that the deck is not recommended to use if you are over 35 years old. If you are obese and have an increased level of prolactin and progesterone. It is advisable not to use the solo deck, but to combine with testosterone. Dosage for beginners are 200 mg. -300 mg. For more advanced amateurs 400-600. Exceed the dosage of 600 mg. For fans is not recommended, since there is a risk of side effects. The course is calculated at the rate of 8-10 weeks. The drug is included in the work quite a long time, 3 weeks after the first injection. You need to chop the dekar once a week. Most often, they combine Dekver with Naposimom in a dosage: Deca 200-250 per week, Naposim 30-40 mg. per day. Decaver has a rather unpleasant property. Linking to progestin receptors, Decaver causes an increase in the production of prolactin and inhibits the production of gonadotropic hormones, which in turn leads to a decrease in the concentration of testosterone in the blood. In connection with the above, the deck, can lead to a decrease in sexual desire (DecaDic). This will be restored a month after the end of the course. In rare cases, the development of gynecomastia is possible. You can avoid these side effects using the course inhibitors of prolactin - Bromocriptine and a more modern and safe analogue of Dosintex. Antistrogesterone activity is possessed by isstanazolol, which will be appropriate in any combination on the courses of the deck. To strengthen the libido on the Decemera course, also apply proviron in a dosage of 50 mg., Per day. If Nandrolone was used on the course, then your drug at PCT is Clomid. ·Begin to apply clomid from the last week of the course and finish 3-4 weeks after the end. ·Dosages of clomid are 50-100 mg. in a day. ·Tamoxifen can not be used. ·You can use testosterone booster. ·For example Tribulus, as an auxiliary drug on the pt. ·If the course duration is more than eight weeks, then it is necessary to include in the course gonadotropin with a 4 week course of 500 mg.
·Twice a week for 3 weeks, as well as 3 weeks before the end of the course at the same dosage. After the course, gonadotropin cannot be used.